The recent film and stage play, Warhorse, based on the book by Michael Morpurgo, highlights the plight of horses during the First World War. 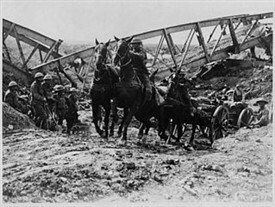 Many thousands of farm and draught horses were requisitioned for the war effort. One of them was the horse at Addiewell Farm, belonging to the Aitken family. You can see a photograph of him on the Scran website, standing alongside Nan Aitken, the daughter of the family. Without a subscription to Scran, you can only see a thumbnail version of the picture. At the Local History Library in Linlithgow, you can see the full captions and full-size images. Or you can buy a six month subscription for just £10. This page was added by Sybil Cavanagh on 07/03/2013.